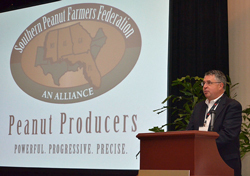 Now that a new farm bill has been passed and is in the process of being implemented, attention in Washington for peanut growers has been more focused on regulations than legislation. “We’ve had gridlock now for most of President Obama’s administration and we’re seeing the administration working more through the regulatory process in moving policy,” said Bob Redding, The Redding Firm. “The fear is a regulation is proposed, we get to make comments, and then the agency decides to do it.” One of those regulations of concern is the proposed Waters of the United States rule from EPA, which Congressman Rick Crawford (R-AR) talked about in detail at the conference.